There is a unique animal living in San Marcos that not many people have seen. The body is compact and sleek with an elongated, pointed muzzle. Dark brown to black hairs surround the large eyes, creating a prominent mask. Large grayish-brown ears are edged in white. A ringtail’s total length ranges between 24 and 32 inches with a tail length of 12 to 17 inches. The tail has seven to eight rings. They weigh from 30 to 39 ounces. Mostly a nocturnal hunter, ringtail cats are not related to cats, but to raccoons and coatimundis. Their favorite prey is mice, squirrels or rabbits and fruit and insects. 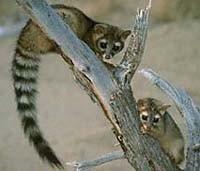 Ringtails den in tree hollows and rock crevices, but rarely stay in one area more than several nights. They are very vocal, making squeaks, chirps, growls, and howls. Ringtails have been sighted in Schulle Canyon and of course, Ringtail Ridge Greenspace.